A distribution transformer is used to reduce higher voltage of electricity to a lower voltage without affecting its frequency. After reduction the electricity can be easily used by consumers in their businesses and homes. 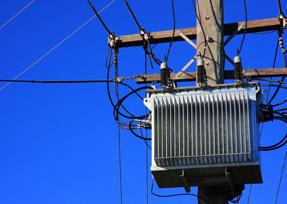 Distribution transformers can be seen on utility poles in the form of metal boxes or cylinders. Distribution transformers may be liquid immersed units or dry-type units. Dry-type transformers may be either medium voltage or low voltage ones. Distribution transformers can be more energy efficient and economical depending on many purchasing decisions. The right amount of investment in these transformers not only reduces energy losses and environmental burden but also helps in reducing costs. All of this leads to higher profitability. Dry-type transformers lead to more energy loss through heat and vibration. The amount of loss caused depends on the type of core used. Amorphous metal cores reduce energy loss by around 70% and have higher efficiency at low loads as well. Energy loss from transformers is classified as (1) no-load loss, (2) load loss (3) cooling loss. No-load loss is the most common of all. Since distribution transformers run on continuously, even a minor improvement in loss prevention can lead to great savings. Aluminum conductors have been replaced by copper conductors which have better strength, lower resistance and helps reduce load losses. The resistance in this transformer is almost negligible due to the high temperature superconducting material used. They have smaller weights and volumes but can be quite expensive. In applications like the railways where weight is an important factor, such transformers cut the weight for higher efficiency. It is suitable in places where the load loss forms a large part of the total loss. Amorphous transformers make the most of low loads. The loss reduction is between 65-90% in comparison to other steel-based transformers. The core of the transformer is amorphous steel which leads to higher efficiency in power distribution and cuts down on the core losses. Hence, the energy savings are quite high. Choosing the most energy efficient transformer among existing models depending on the load on the transformer. NEMA standard TP1 complaint transformers minimize no-load losses when the transformers are lightly loaded. The 80ºC low temperature rise transformer is more effective in loss prevention when the load is higher.